No one could fail to know that we’re in the middle of a General Election campaign, with promises of spending more money being sprinkled around like confetti at a wedding. What is almost certain, unless something dramatic happens, is that we will either have another coalition or a minority Government. In a sense, that has fuelled this desperation by the main parties, as they see their historically dominant positions undermined by the rise of the smaller parties and the increasing diversity in people’s voting habits. But the electorate is not amused. It is fed up with hearing what politicians have decided they want talk about: Scotland. The polling organisation YouGov recently asked people whether they had heard too little or too much about a variety of different topics during the election campaign. The top answer came back with the interesting statistic that 40% of people want to hear more about the environment (tied with education). Yet we’ve barely heard a whisper about this or related subjects such as road building. After all, the coalition secured a budget of £1.2m for a short bored tunnel on the A303 past Stonehenge with much fanfare last December. 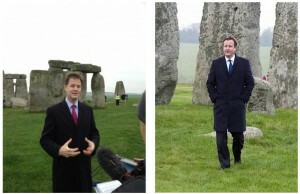 Both coalition leaders claimed this as their own a success to woo business interests in the South West, – and, presumably, voters – provoking historian Tom Holland famously to complain that “Britain’s most celebrated archaeological site should not be offered up as a sacrifice on the altar of electioneering,” and a rush of petitioners against the proposal. the parties have nothing major to say on the issue? they think the electorate isn’t interested? they don’t understand the issues? they cannot square their love of big new infrastructure projects with their impact on the environment? The situation at Stonehenge exemplifies the problem that focussing on big new roads creates. We are a small island with a lot of people and a long history. There is someone or something that will always get in the way. That doesn’t mean you don’t change anything, but do politicians really think that damaging one of the most iconic World Heritage Sites is really the right (and electorally popular) way forward? The problem with their approach is that if they back down over this then they are concerned that they then risk being seen as weak. Yet a bit of honesty would not go amiss. “We got it wrong” or “We will find another way that doesn’t jeopardise our history and our tourist economy” are statements that would be welcomed by many. At a time when we are condemning such wanton vandalism to ancient monuments in Iraq and Syria, to continue unaccountably on their highly damaging path looks nothing more than a mixture of stubbornness and arrogance. Let’s hope that whatever Government is formed, we get a more sensible approach to transport planning and that our politicians learn to appreciate that our environment and our heritage are not an inconvenience but a major asset. If you are opposed to the short bored tunnel in Stonehenge World Heritage Site please sign the petition here.